Andy’s Sprinkler, Drainage and Lighting has been serving the Cibolo community for over 20 years. Our reputation precedes us as the most knowledgeable and friendly company providing sprinkler repair, drip irrigation and landscape lighting in the area. Our specialists consistently provide top quality service. We are honored to have received several awards for our commitment to service, workmanship, and value over the years. 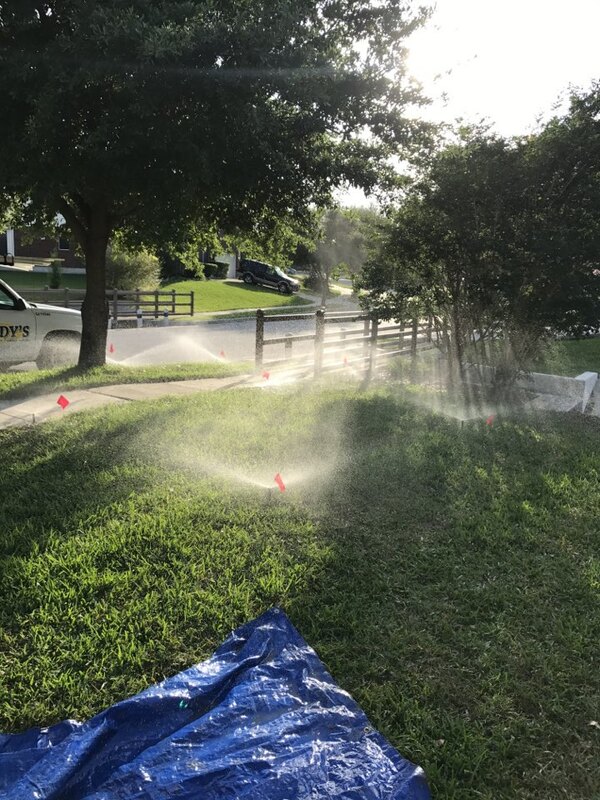 Whether you need sprinkler repair or drip irrigation, Cibolo Texas residents can depend on Andy’s Sprinkler, Drainage & Lighting! Layne and his crew did an outstanding job & I would highly recommend them. We had a major problem with the old system and multiple pipe breaks. Layne and his team were able to re-engineer and replace the entire area. Completed general maintenance system check. Repaired drip lines. Investigating a poorly installed French drain and sump pump in cibolo tx. Looking into a surface run off issue for drainage in cibolo TX. Replaced 1” zone valve that was broken. Completed system check. Installed a new controller with up to 7 zones. Also offered recommendations for repairs to the irrigation system. Adjusted pressure regulator. Found water meter partially closed: affecting volume to system. Installed MP Rotator nozzles. Completed system check. Adjusting and straightening heads for uniform coverage. General maintenance system check completed. In the heat of the Texas summer or the chill of our unpredictable winter, your Cibolo lawn requires regular irrigation to survive and thrive. Andy’s specializes in keeping sprinkler systems of all types in peak working order year round. Our technicians are highly skilled and equipped to handle any issue, large or small. Andy’s works to give you the greenest, healthiest landscape possible in Cibolo, TX. However, we also know the importance of protecting the local environment and conserving water. That’s why we highly recommend a properly designed drip irrigation system. Drip irrigation minimizes runoff, reduces evaporation, and encourages deep percolation of water into your soil. These benefits emphasize the importance of why Andy’s Drainage takes a whole-system approach to Cibolo lawn landscape drainage. All your applicable functions and fixtures must work together for the improvement and protection of your property value. We rely on science, not guesswork, when it comes to drainage systems. Andy’s Drainage in Cibolo TX can correct any drainage issue you’re having. Whether we’re implementing French drains, sump pumps, channel drains, catch basins, or grates, we make sure you’re taken care of. No matter what type of soil you have, or existing landscaping, we can determine the problem, discuss the best solutions and professionally install your yard drainage system in very little time at all. We know Cibolo Texas residents spend considerable amounts of time and money on landscape design. Andy’s can assist you in advancing to the next level with beautiful landscape lighting. Your lush green lawn, flowering plants and manicured shrubs will be the highlight of the neighborhood the minute the sun goes down. Just 13 miles east of San Antonio, Cibolo lies within two counties: Guadalupe and Bexar. Known as Metrocom, this area contains several cities as well as Randolph Air Force Base. Cibolo began in 1876 when the Southern Pacific Railroad cut through the town, connecting it to Houston and San Antonio. The fertile land made the area perfect for agriculture, and residents profited from the major cash crop of the time, cotton. Today, Cibolo is a growing city with a booming housing industry offering country living to those who wish to escape the large city life. Don’t let the Texas weather ruin your landscape, call our Cibolo sprinkler, drainage and lighting specialists today. When you need it done right the first time, call Andy’s. We serve entire Cibolo, TX 78108.